Arezou Soltani is a Senior Research Fellow with the Centre for Social Impact , and Information and Communications Technology Advisor of the Social Data Analytics (SoDA) Lab. She is currently looking at applying the state-of-the-art data analytic techniques to resolve wicked social science problems. 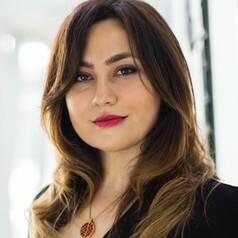 Arezou obtained her PhD from RMIT University on the topic of digital watermarking and has been an active researcher in the area of privacy enhancing techniques and implications of big data on information security.